Just like building physics, performance based building design was hardly an issue before the energy crises of the 1970s. With the need to upgrade energy efficiency, the interest in overall building performance grew. The term "performance" encompasses all building-related physical properties and qualities that are predictable during the design stage and controllable during and after construction. The term "predictable" demands calculation tools and physical models that allow evaluating a design, whereas "controllable" presumes the existence of measuring methods available on site. The basis for a system of performance arrays are the functional demands, the needs for accessibility, safety, well-being, durability, energy efficiency and sustainability and the requirements imposed by the usage of a building. 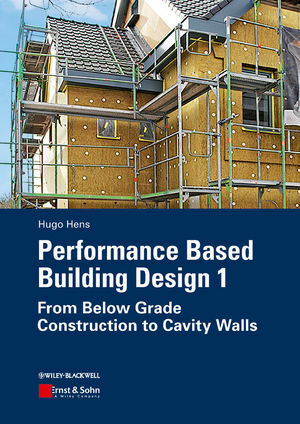 As the first of two volumes, this book applies the performance rationale, advanced in applied building physics, to the design and construction of buildings. After an overview of materials for thermal insulation, water proofing, air tightening and vapour tightening and a discussion on joints, building construction is analysed, starting with the excavations. Then foundations, below and on grade constructions, typical load bearing systems and floors pass the review to end with massive outer walls insulated at the inside and the outside and cavity walls. Most chapters build on a same scheme: overview, overall performance evaluation, design and construction. The book is absolutely recommended to undergraduates and graduates in architectural and building engineering, though also building engineers, who want to refresh their knowledge, may benefit. The level of discussion assumes the reader has a sound knowledge of building physics, along with a background in structural engineering, building materials and building construction. Where and when needed, input and literature from over the world was used, reason why each chapter ends listing references and literature. Prof. Em. Dr. Ir. Hugo S.L.C. Hens, University of Leuven (K.U. Leuven, Belgium), taught Building Physics from 1975 to 2003, Performance Based Building Design from 1970 to 2005 and Building Services from 1975 to 1977 and 1990 to 2008. Until 1972, he worked as a structural engineer at a mid-sized architectural company, constructing houses, apartment buildings and office buildings. He has authored and co-authored over 150 articles and conference papers, and written hundreds of reports on building damage cases and their solution. He has been coordinating the international working group CIB W40 on Heat and Mass Transfer in Buildings for ten years. Between 1986 and 2008, he was operating agent of four Annexes, initiated by the International Energy Agency's EXCO on Energy Conservation in Buildings and Community Systems: Annex 14, Annex 24, Annex 32 and Annex 41. He is also a fellow of the American Society of Heating, Refrigeration and Air Conditioning Engineers (ASHRAE).